A couple of months ago, I saw an advertisement on the Trader Joe’s website for a pie contest. The rules were: (1) to use up to 5 Trader Joe’s products (binding agents don’t count in the ingredient total); (2) don’t use any alcohol; and (3) the recipe must take 20 minutes or less for preparation (not including cooking time). Since I love Trader Joe’s, and I love contests, I decided to give it a try. I wasn’t selected as a finalist, but the recipe was pretty tasty, so I thought I would share it here. 1. Before you begin, leave the frozen pie crust, cream cheese, peanut butter and butter on the kitchen counter for one hour to allow the ingredients to soften. 2. Preheat the oven to 375 degrees. 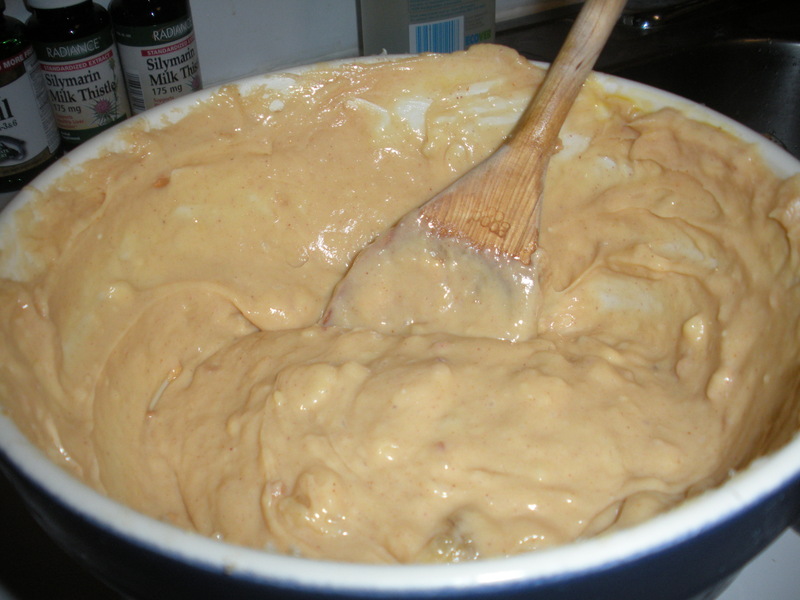 In a large bowl, combine the cream cheese, peanut butter, butter and sugar. 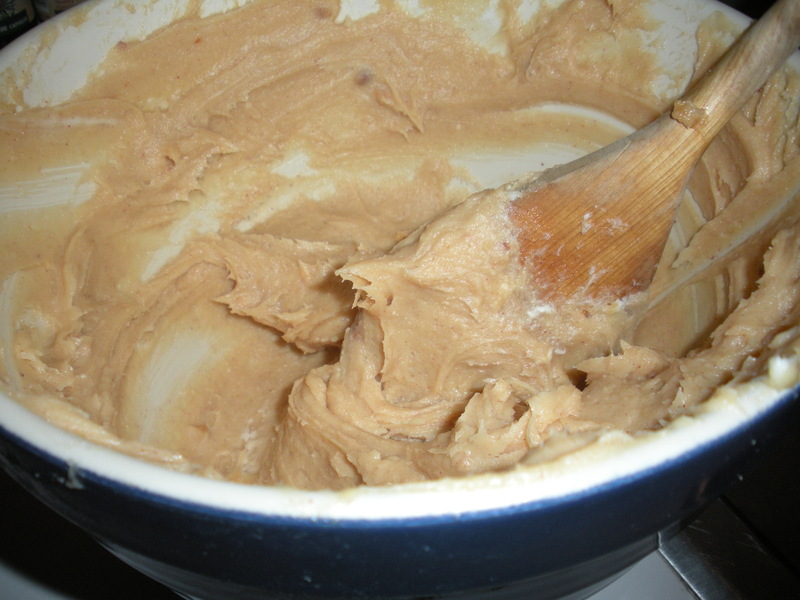 Cream with either a wooden spoon or electric mixer until smooth and well-mixed. 3. Add the eggs and bananas and continue to cream until smooth and well-mixed. 4. In a pie plate, carefully arange the pre-made crust. Pour the creamy mixture into pie plate and place on top rack of the oven. Bake for 25-30 minutes, or until pie crust is golden around the edges. 5. Turn off the oven and allow the pie to sit in the oven for one hour. This will allow the pie to cook evenly throughout. Go do something fun during this time. 6. Remove the pie from the oven and set aside to cool. Meanwhile, simmer around 3 cups of water in 2-quart pot over the stove. 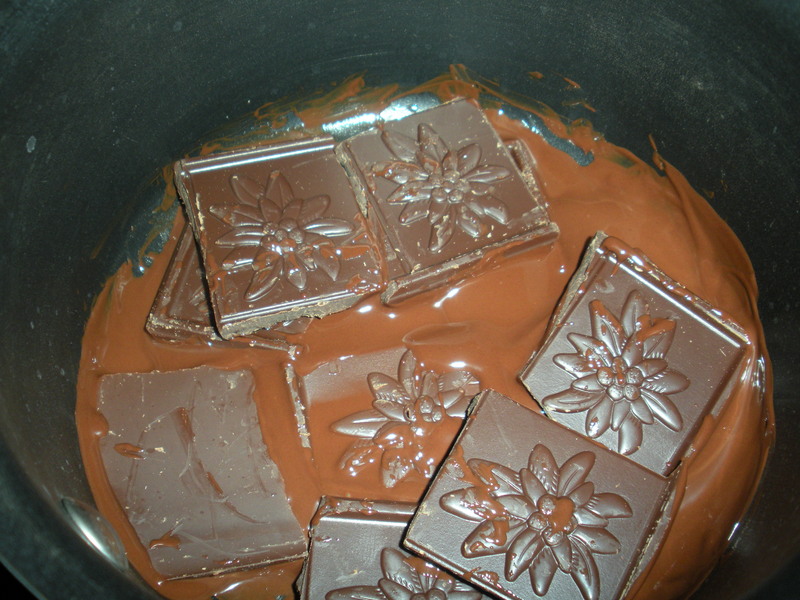 Place a smaller saucepan with the chocolate, broken into pieces, inside the larger pan. Voila! In less than 5 minutes you will have melted chocolate. This is a great way to melt chocolate in general without it burning over direct stovetop contact. 7. 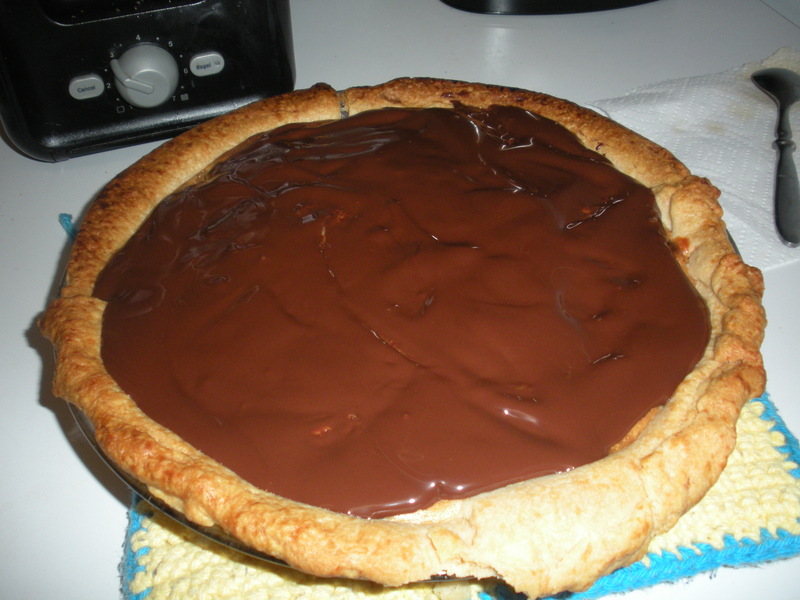 Pour the melted chocolate over the pie and spread evenly over the top. Allow it to cool before serving. The pie tastes even better the second day. This entry was posted in DIY, Recipes and tagged bananas, cheesecake, peanut butter, pies, recipes, Trader Joe's. Bookmark the permalink. I’m thinking I might just have to make this for my grandmother and her sisters who are all ELVIS fanatics!